Credits first: Thanks to Schiehallion for the post on https://urbanglasgow.co.uk/the-battle-of-langside-t1118.html of December 27th 2008. And also to the 450 year Battle of Langside commemoration pamphlet from Langside Community Heritage, which triggered this article. The Langside Heritage trail leaflet can be downloaded here: https://www.glasgow.gov.uk/CHttpHandler.ashx?id=32316&p=0 [as at June 3rd 2018]. The following text is taken verbatim from Schiehallion's post, and some others as well. Why this article: because Cathcart Castle and Court Knowe are in Linn Park, and in the winter [no leaves on the trees] most of the places described can be seen from Lord Cathcarts monument at Court Knowe. Born in Linlithgow in 1542, Mary is crowned Queen of Scotland one year later. Although Henry VIII wants her to marry his son to unite the crowns, Mary instead marries the French Dauphin, Francoise when aged 16. One day they will be monarchs of both Scotland and France. Three years later her young husband dies and she returns home to her Scottish crown but Scotland has changed as protestantism sweeps the country. At 23 years of age she marries Lord Darnley and proclaims that she will respect and be tolerant of the new protestantism even although she is a Catholic. John Knox is not impressed. The following year she gives birth to a baby boy, the future James VI, and sends him to Stirling Castle for his safety fearing the Protestant Scottish lords will not want the boy raised a Catholic. Shortly afterward her husband. Lord Darnley is murdered and the Protestant lords accuse Bothwell of the crime. Mary subsequently marries Bothwell and both are now hunted by the nobles. At Carberry Hill both are captured and at the age of 25 Mary is imprisoned in Lochleven Castle. She is forced to abdicate her throne and her son, now being raised by Protestant lords, is crowned King James VI. One year later in 1568, Mary escapes prison and raises a force of 6,000 men to win back her crown. Her half brother, the Regent Moray, is running Scotland while he raises his nephew, and her son, James VI who is too young to perform the role of king. The future course of James VI's life now depends on the outcome of a meeting at Langside between his estranged mother and his uncle. Mary is at Hamilton Palace planning to travel through Glasgow to Dumbarton Castle for refuge and to reinforce her numbers, already at 6,000. The Regent Moray is in the Bishop's Castle in Glasgow where he urgently raises a force of 4,000 including 600 Glasgow men. Mary held a council of war at Hamilton on the evening of May 12th 1568. This was her army and where they gathered in Hamilton near to Hamilton Palace. She made the Earl Of Argyll her commander. Meanwhile the Regent on hearing from a messenger that she was planning to march, moved his army out onto the moor of Glasgow which was the area just outside the Gallowgate Port. The Port was exactly where I've marked it and the army would've been gathered on the site of present day Barras. On the morning of May 13th 1568, Mary began her march. 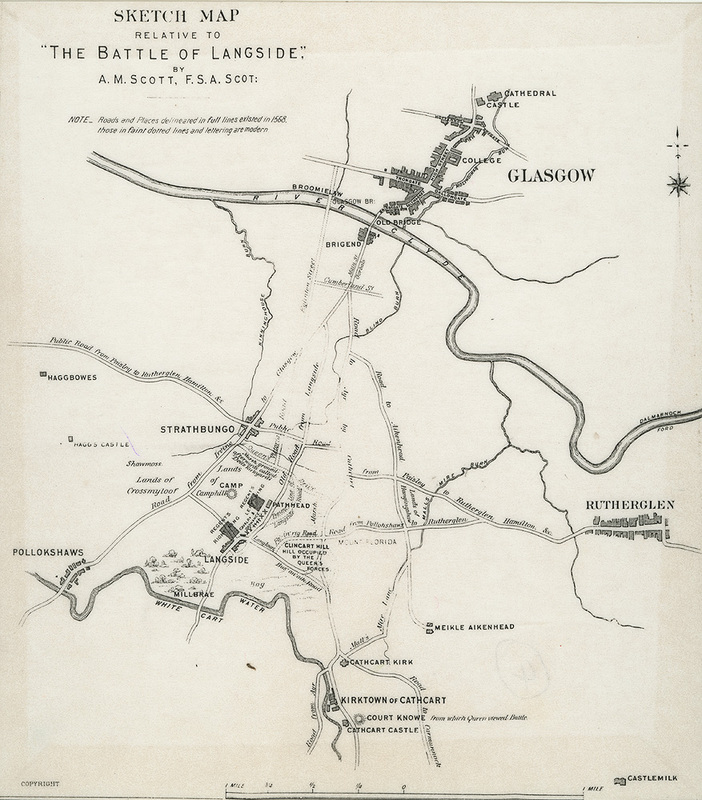 She followed the River Clyde up to Rutherglen before spotting the Regents' forces amassed the the moor of Glasgow. She decides to head due west for Clincart Hill, Langside Hill, Crookston Castle then on to Erskine where she can ford the Clyde. The Regent, seeing (and anticipating) her changing her course rushes his forces over Glasgow Bridge and out the Langside Road to Path Head Farm and Langside village. The race is on for the high ground......and Mary loses as her commander, Argyll is repeatedly unwell en route. For the following 5 images, watch the Black [Regent's Army] or White [Mary's Army] oblongs move around. So now the two sides face each other from neighbouring hills. The Regent is spread across Langside Hill. His right flank at Langside village. His left flank spread scross the Queen's Park behind the Victoria Infirmary. The Queen's forces stop on Clincart Hill, the hill into which Mount Florida train station is cut. The Queen herself moves south to a site near to Cathcart Castle to view proceedings from safety. Here is the starting position. The Regent places Kirkcaldy of Grange as commander of both flanks as the two sides begin firing cannon at each other across the sites of Langside College and the Victoria Infirmary. In the first phase of the battle, Mary's forces try a twin pronged attack. Hamilton leads an army along the Bus 'n Aik (bush and oak) road to the foot of the Lang Loan. The Bus 'n Aik road and the Lang Loan would later become Battlefield Road. Meanwhile Lord Herries leads a cavalry charge across the site where the new hospital is being built and is met by Douglas of Drumlanrig. However Douglas retreats meaning Hamilton feels confident in pushing forward with Herries to back him. Decisively though, hagbutters (troops with rifles) are sent down from Langside to shelter behind the walls and in the gardens of villas bordering the Lang Loan. As Hamilton's men move up the Lang Loan they are met with resistance from the top of the hill and hagbutters are firing into their left flank. Douglas of Drumlanrig, bolstered with archers, attacks Lord Herries again and pre-occupies him. Kirkcaldy of Grange, realising the left flank is secure instructs them to flood down over the site of the Victoria Infirmary and attack the right flank of Hamilton's forces. Hamilton's men are now trapped on that wee bit of Battlefield Road from the Battlefield Rest to the monument. Between 300 and 400 are killed and the rest flee back along the road. The Regent instructs his men to spare the lives of the escapees. The battle is over, men flee to avoid imprisonment and Mary sets off to England to try to work things out with her cousin Elizabeth I. She never gets to meet Elizabeth. After 19 years imprisonment, she is stitched up in a sting and is beheaded at Fotheringhay Castle. It is rumoured that the dead from Langside are buried in the marshland that would later become the Queen's Park boating pond on Pollokshaws Road. From Stuball on December 28th 2008. Crossmyloof has been linked to her but quite simply, that area was west (behind) the Regent's line. I have read that areas such as Crossmyloof are remnants of areas where a cross marked the perimeter of a parish. Crosshill being an example of another one. Of course she and her half brother left their mark all over the area with Lochleven Road (the castle she escaped from), Dundrennan Road (the castle she sheltered in en route to England), Bolton Drive up on Clincart Hill (Bolton Castle was one of the strongholds she was held in while in England), Queen Square, Regent Park Square and Moray Place over at Pollokshaws Road, the New Regent pub and the Fotheringay pub in Nithsdale Road (mispelled as she was actually executed in Fotheringhay Castle with an 'h'!). Even Grange Road at the Victoria Infirmary is named after Kirkcaldy of Grange who's decisive command ended the battle. I was amazed to see the old name of Battlefield Road, the Bus 'n Aik road appear in the 1892 ordnance survey map as the 'Bushinaike Dairy' immediately east of the Mount Florida to Cathcart railway line. The Mount Florida mineral depot is where the two multi storeys are. The 'Aik' (oak) of course also featured in the head of the oak forest road which later became Aikenhead Road. Mary's army would have came up the old road that joined Pollokshaws to Rutherglen which is now called Prospecthill Road (look at attached map). But due to the steepness of the hill even today ! they would have worked themselves around onto Clincart Hill (where Langside College stands today) and the Bush & Aike Lane - (now called Battlefield Road). The rest you can read in the first post, but the 300 killed as stated was actually when Mary's army broke and were running for their lives. The rout was due to the calvary charge into their flank as well as the shooting from the slopes of what is now Queens Park. The estimated casualities are less then 40 during the actual battle itself. Infact some ignorant Historians have said that this should be labelled a skirmish and not a battle which I totally disagree with! As to the location of Mary on the battlefield... this has always been questioned... the 'official' location as we all know is the Court Knowe on the adjacent hill to where the beautiful Cathcart Castle once stood (again whatever councillor decided to destroy this should be put into a deep dungeon!). But it doesnt take a military genius to ask why would her vanguard allow her to stand in the shadow of one of her enemies castle who was on the field of battle against her? Looking at old maps online and knowing the terrain well though there are a dozen different possibilities- but overall I would suggest that her location could possibly be in the Kingspark area. If you follow the terrain from the Court Knowe it leads through the Kings Park along to Menock Road and Aikenhead Road - which is where according to the old maps - the old pathway called Malls Mire is located. This area is well within range for her to ride to her troops during the battle and attempt to spur them on as is recorded in eye witness accounts, and its probable that when the battle turned fore the worse she rode back in this direction of the Aitkenhead Road / Menock Road- perhaps spawning the legend of Malls Mire. I believe that she headed up what towards Castlemilk House and over the Cathkin Braes heading to the south. This is due to the legends associated with Mary and Castlemilk. Such as her supposedly staying at Castlemilk House on the eve of battle (though its unlikely) but perhaps she and her vanguard went there to get extra supplies (considering the supply wagons would have been lost and left behind). There was also a cairn (now long gone) called Mary's Cairn ontop of the Cathkin Braes where she apparently watched the battle - but perhaps this is where she used the vantage point to look back to see the extent of the rout. Also in the Cathkin Braes the party watered their horses at a well - which was known thereafter as Mary's Well. (I will do a seperate post about this one day). It's interesting to think that Lord Herries cavalry charged through what is most likely my office, several hundred years ago. Also that Grange Road is named after another of the victors. I also mistakenly believed that Mary passed through Crossmyloof but now know this isn't correct and that the info outside the Corona pub in Shalwands is incorrect. Note: Need to go and see this info? Is it still there ? The most significant battle to take place within Glasgow city boundaries was fought at Langside in 1568. On the morning of 13 May, forces in support of Mary, Queen of Scots were marching from Hamilton towards Dumbarton Castle when they found their path blocked by troops commanded by the Regent Moray. The two armies drew up lines of battle as shown on the map. Clincart Hill is now the site of Langside College. After an unsuccessful cavalry charge, Mary's foot soldiers approached Langside Hill up the Lang Loan, now Battlefield Road. The two armies clashed in the area where Battlefield Memorial now stands. For some time the issue was in doubt, but reinforcements on the Regent's side attacked the Queen's troops in the flank, and they were forced to withdraw. The retreat became a rout, with an estimated 300 killed on the Queen's side, and only a handful of fatalities in the Regent's army. After the battle, Mary fled south. She spent her last night in Scotland at Dundrennan Abbey, near Kirkcudbright (an event commemorated by Dundrennan Road in Battlefield) before crossing to England to face captivity and eventual execution. A postcard view looking south towards the Battlefield Memorial in Battle Place, Langside, early 20th century. The column is 16 metres high and was designed by the architect Alexander Skirving. 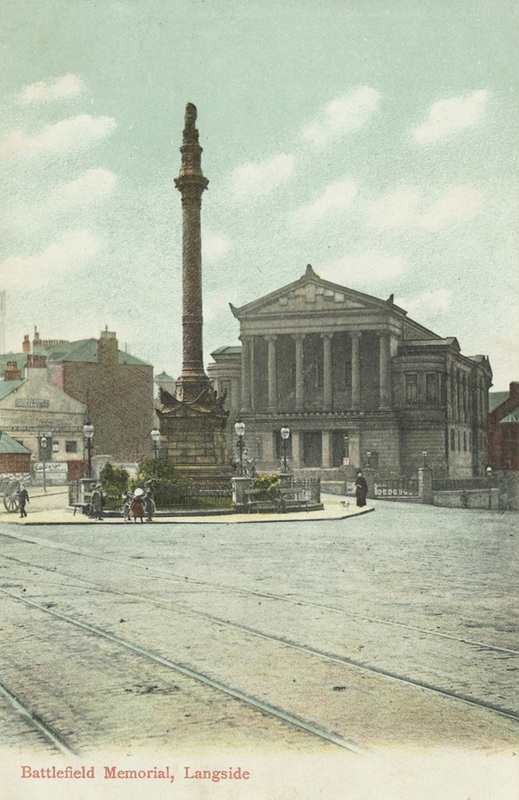 It was erected in 1887-1888 to commemorate the Battle of Langside, 1568, at which Mary Queen of Scots’ army was defeated by the forces of James Stewart, Regent Moray. A spiral patterned with thistles, roses and fleurs-de-lis winds its way to the top of the column where a lion sits resting its paw on a cannonball. The decoration was sculpted by James Young and the structure was built by Morrison & Mason. In the background is Langside Hill Free Church which was also designed by Skirving and built 1894-1896 in the Greco-Roman style. It was renovated during the 1990s and became a restaurant and bar.